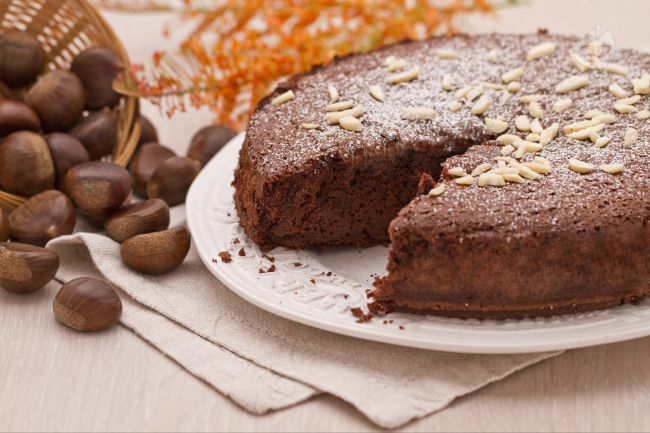 Giannetti Artisans new recipe of our Chocolate Chestnut Flour cake is a great recipe for the fall season. Using our excellent Chestnut Flour brought to you from the hilltops of Garfagnana, Tuscany right outside of Lucca. The sweetness of the chestnuts and the unsweetened chocolate creates an excellent combination for a tasty breakfast companion or for an afternoon snack. Put sugar and eggs in a mixer and mix until you obtain a clear colored cream. Add previously sifted cocoa powder and baking powder. Mix delicately all ingredients with a wisp. Sift Chestnut Flour in a large bowl then add milk. Mix until you obtain a smooth and dense cream. Unite to other cream (sugar, eggs, cocoa powder and baking powder) and delicately mix everything together. Mix from bottom of bowl to top. Butter & dust with some flour a 10 inch pan to avoid sticking. Bake at 350°F for about 45-50 min. After cooled sprinkle with powdered sugar and enjoy!